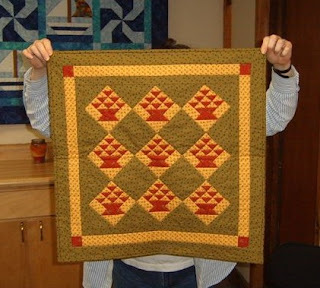 Quilting Adventures: Jo's Little Women's Club....! Our Shoppe is hosting part 8 of Jo's Little Women' Club . We meet the second Thursday of the month. We opted to not follow the sequence that was provided for us and did the second quilt first. This is my version of Meg's Basket a pattern from Jo Morton! I called it Holiday Baskets! It became a gift for my Secret Santa partner Kaaren from The Painted Quilt blog. You might want to check out her blog, it's really nice. The SSCS is organized by Donna from Chooyblue. I've been a part of it since Donna first started! Lots of fun! your little basket uilt are sooo sweet. Jo's Little Women' Clus seems so fun. Carole your basket quilt is wonderful...Kaaren was a very lucky girl to have you for her Secret Santa. It is beautiful! Sounds like a fun group too. Catching up on all your beautiful new pieces. I really need to figure out how to do name tags, I love how it looks. What a sweet little quilt. I need to check out the Jo Mornton patterns I read so much about in the blogs. I love those colours, the quilt is gorgeous. Hi Carole...been far too long since my last visit! Love that little quilt and Happy New Year...thanks for sharing snow! What a gorgeous basket quilt! Love it! You are accomplishing so much, I love to pop by and see what you are up to. You did a great job on your gift. The color combination is great thanks for teh link. Really sweet little quilt, Carole. I love it! OH my goodness I am in LOVE with that quilt. The colors are to die for. I LOVE IT!!!! Nice job Carole.